Deborah Tosline wrote and published Skin Remodeling DIY: An Introduction to the Underground World of Do-It-Yourself Skincare in 2015. Her approach to skin care is based on a scientific background, love of research and over 30 years of DIY skincare experience. Hello! Here we are at the end of 2018 with the fresh New Year only minutes away! Last month, I fell behind my goal to write a monthly article (Life!) but I did not stop thinking about sharing DIY skin and lifestyle practices that promote self-care, improve quality of life, reduce personal costs, and promote sustainability for our precious Earth and ourselves! Its time to ditch some “products” and treatments, save some hard earned bank, reduce waste, promote personal health and reduce synthetic chemical exposure by avoiding processed foods and material goods that are easily replaced with whole natural products straight from the Earth. Skip the manufacturer, wealthy corporations and their advertisers who work hard to convince you that you need to buy their products, live the lifestyle they promote, and line their pockets with gold. No doubt, some pre-made stuff is worth buying but rampant consumerism is a burden and appears to be hazardous to the planet and us all. In many ways, the best way to nurture personal health is to blend some of the simplest, oldest practices with advanced, new protocols. Once again, I summarize some of my favorite routines, tools and techniques for healthy skin because they continue to be effective for me. I will be 60 years mature in a few months and I strive to mature gracefully. I am not into selfies (awkward for me) but I did take this photo December 27, 2018. While I may buy the very best clothes at the thrift store, I am not a fancy woman. 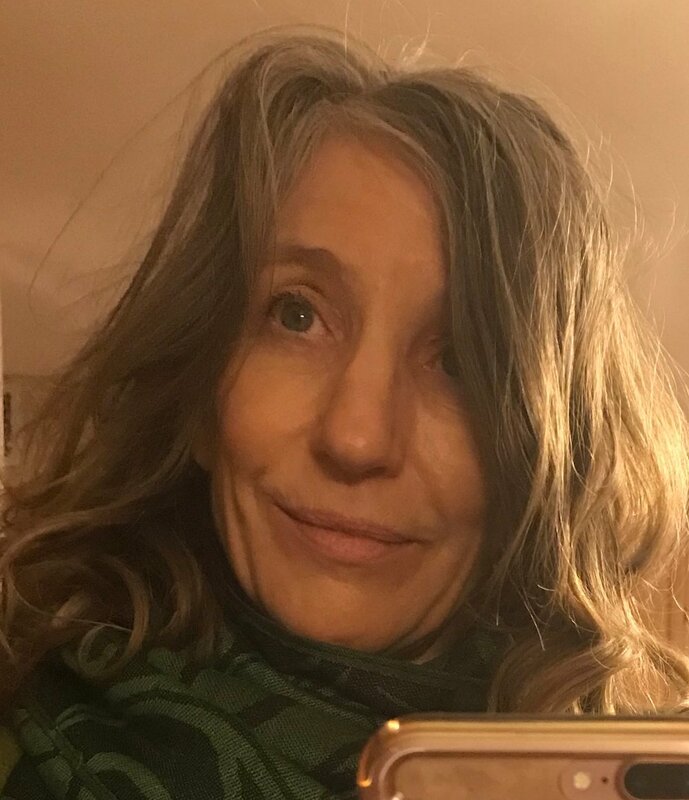 Author selfie, December 27, 2018; natural hair, little make-up and a bit disheveled. On the cusp of 60 years, author goal = mature gracefully. Important note: No skin care practice or cream will make up for an unhealthy lifestyle (this is the New Year - New You part). Remember for flexibility, any day may be a resolution day. Do you ensure that your car, home, appliances, tools, machines, devices, and clothing are well maintained? Without you, none of it matters. Maintain yourself first. Like most of us, I work a full-time demanding job and have weighty personal responsibilities. I know that it is challenging to add new routines to ones lifestyle, but it is vital that we let go of some things and develop efficiencies so that we may support self-care and self-maintenance practices. This will set the foundation for successful facial treatments. · Intentional movement. Use walking and any and all forms of cardio movement one-hour per day, six days per week. Be prudent but push yourself a little beyond your normal and increase the push over time. Begin immediately, whatever level you are at, start small and build. Integrate movement into errands and friend time. Pre-historically, we had no claws or fangs to fight but we had brains and we could run far for a long time. Our survival was dependent on our physical abilities. Don’t let this go. · Stretch, flex, and strengthen. Yoga has been practiced for at least 4,000 maybe 10,000 years. Humans through time understood the need to maintain the body machine. Don’t chose to lose flexibility and strength. Stay strong. · Sleep. Learn about sleep hygiene, establish a personal routine and follow it. Try to get 8 hours of sleep every night. The body completes maintenance and the brain eliminates waste during deep sleep. Do not work so hard that you wear your body down, instead promote self-rejuvenation. Save your deep inner strength for an emergency. · Soft-tissue and fascia self-care. Soft muscle tissue becomes congested. Fascia encases your muscles and can become tight and twisted. Lumps, knots, and tight spots must be softened, loosened and eliminated for proper movement and circulation. Massage and trigger point therapy will keep you supple and pain free. This includes facial soft tissue. · Consume whole, nutrient dense, anti-inflammatory foods – avoid processed stuff! Feed your health (= beauty) to fend off disease. Don’t consume calories that offer no or low nutritional value. Learn how to substitute whole foods and alternative ingredients into delicious nutrient dense snacks, meals and beverages. I apologize for being negative but please avoid mainstream processed products. Just because a product is pervasive does not mean that it is good for you. Stick with whole foods that contain high levels of nutrition and anti-oxidants. · Avoid synthetic chemicals. Yes, the amazing body will successfully process these chemicals, for a while. Optimize your body function and nurture it instead of causing it to work hard to eliminate synthetic wastes. Women are reported to apply more than 500 synthetic chemicals per day using personal care products. This does not include synthetic chemical exposure in foods, material goods, and clothing. Take action! · Reduce stress. This is a must for quality of life and longevity. Cortisol is produced under stress and degrades collagen. Meditate, practice mindfulness and calming breath techniques. Use adaptogens to balance body biochemistry. Avoid stressful folks whenever possible. · Dry Brush and Sauna once a week. Get yourself a stiff natural bristle brush or scrubber and brush/scrub your body. Start at your extremities and brush/scrub towards your heart to promote lymphatic circulation and enhance metabolic waste removal before you sauna. Any kind of sauna will do, hot, dry, stream, near-infrared, salt, etc. Saunas promote circulation, reduce inflammation, expel toxins and clean pores, and are quite relaxing. Saunas are an integral part of life in many parts of the world. Embrace this health related tradition. Skincare Routine – its pretty simple. · Nightly – use a micro-fiber cloth for facial cleaning/scrubbing with the occasional Oil Cleansing Method. · Morning - rinse with plain water with an occasional micro-fiber scrub as needed. o DIY vitamin C serum- for collagen and more! · Facial Exercise – for me this is mandatory; I began in 2002. Start anytime! I use the FlexEffect system for resistance training to build muscle. Isometric exercises do not build muscle, but they do maintain current muscle strength. When you begin, try to do facial exercises as frequently as possible (daily). I am currently practicing a lower facial “bootcamp” to amp things up. The underlying fascia and muscles support facial skin. Strong full facial muscles will lift sagging skin. Begin now! For example, maintain or build the strength of your Platysma (neck) muscle. · Micro-needling, Dermarolling, or Percutaneous Collagen Induction Therapy – I’ve completed DIY micro-needling facials 4-6 times a year for ten years. Check out an interesting research article summarizing the amazing effects of micro-needling here. I’ve been using the Derminator 2 and it is truly a gift. This is the easiest way to complete a DIY dermaroll or to use a single needle to reduce (or eliminate) facial lines. Save big bucks while you reorganize and rejuvenate skin. · Facial lymphatic massage. This is a must to ensure proper flow of body wastes from the facial areas. I eliminated fluid retention beneath the eyes using facial lymphatic massage, yay! I now believe that lymph congestion exacerbates puffiness under the chin and neck region as well. Facial lymphatic massage is easy! Choose yourself this year with the gift of personal maintenance. This is not a luxury; self-care is necessary to support a high quality of life throughout your life. In addition, optimum physical health will support and enhance facial treatments and beautiful skin. If you need more information, conduct a little Internet research, read my past Blog articles, or get my book "Skin Remodeling DIY: An Introduction to the Underground World of Do-It-Yourself Skincare". Make this your best self-care year ever!